"A Press is a Press"
They inflate, deflate, and rotate. What should I consider when buying a press? Basket Press, Tank Press, or Open- Style Bladder Press? There are three general types of presses offered by Carlsen and ENOTOOLS. 1. Side Membrane, Open Style Bladder Press. 2. Side Membrane, Closed or "Tank Style" Press. During harvest, the press is the most important piece of wine making equipment. We are extremely proud to offer Puleo brand presses which have been built in cooperation with Carlsen & Associates. Jim Carlsen, the humble founder of Carlsen & Associates says, "A press is a press. Essentially they are all the same. They all inflate, deflate, and rotate." 1. Tank or Open Style Bladder Press? Not our decision. Most often, we sell open style bladder presses. You may like the idea of a tank type press. It's basically the same machine, it just has less exposure to air. 2.What size should I get? We can help with that. We will answer this question for you. Like buying shoes, a press can be purchased by type/ brand/ manufacturer/ features/ warranty/ service first, then for it's size. How do you plan to fill it? Be prepared to provide tonnage, number of varietals, 5- year production projection, red to white ratio, percentage of hybrids vs. vinifera, type of power (do you have 3-Phase? What voltage? ), etc. We can also refer you to a press sizing guide. 3. Is it easy to clean? Yes. If you are doing this yourself or have very expensive labor that question very important. Our side membrane presses are the easiest to clean. We train you on our proprietary, water saving , super easy clean in place method. 4. Is it reliable? Yes. Our presses have NO MINIMUM LOADING. This leads to bladder longevity. We stock the parts domestically and many are out of the Grainger catalogue. The presses are built for commercial- grade, professional scale use. We do not build a machine to a price point. We build what works. We almost never have a customer lose time on the crush pad. 5. Do you support it? Yes. Every machine on this planet CAN break. It's what we do about it when it does that makes us reliable. 6. Can I program it? Yes. And our presses are pre- programmed before you use them. There are 12 easy to use automated programs for all of your routine types of fruit and two ways to use it manually for that crazy, small, or special lot. It is very easy to use. Remember: Carlsen are the guys who sell the two man crushpad. This is EASY. You can start, stop, inflate, deflate, and rotate all from right here- either manually or on auto- pilot. 7. Not your average question, but a solid point: Is there a drain pain with a removable screen and a mount for an optional float switch for pump control in the price we quote? YES. Is this pan also useable as a pumpover sump? Yes. 8. Should I use house air or the available on board compressor? If your press is over 36 HL, use house air. Your price will reflect the deleted option. Your press cycle times will drop like a rock. My opinion is that Mr. Carlsen's team have assembled what embodies the breakpoint where quality and price intersect on the grand scale. Our press is comprised of an impressive list of domestically available components made by top- tier manufacturers. These are parts just like the ones on the really expensive presses. Carlsen & Associates' Puleo series of presses are built right, easy to clean, easy to program, and cost effective. The parts on a Puleo wine grape press are utilized to work with or separate from one another (through three separate operation modes). These presses can operate independent from their brain in case of failure because failure is not an option during crush. If something breaks on your press, our nation wide response time is among the best. With five troubleshooters and four technicians in the U.S., we have you covered. Your money will not buy a more reliable press than ours. Please consider using our customer list. A little time invested in due diligence will pay off. Bottom line: Our presses are easy to use, easy to clean, and they work. A basket press is good for a boutique where maybe one or two varietals is the focus. They allow for the highest quality of juice or wine with some sacrifice in yields. The advantage here is faster turnaround. Another plus is the "eye- candy" side of the discussion. A basket press is actually a decorative piece of crush equipment which even the neophyte can appreciate. The basket press that we sell is made in the USA by Carlsen & Associates of beautiful Healdsburg, CA. 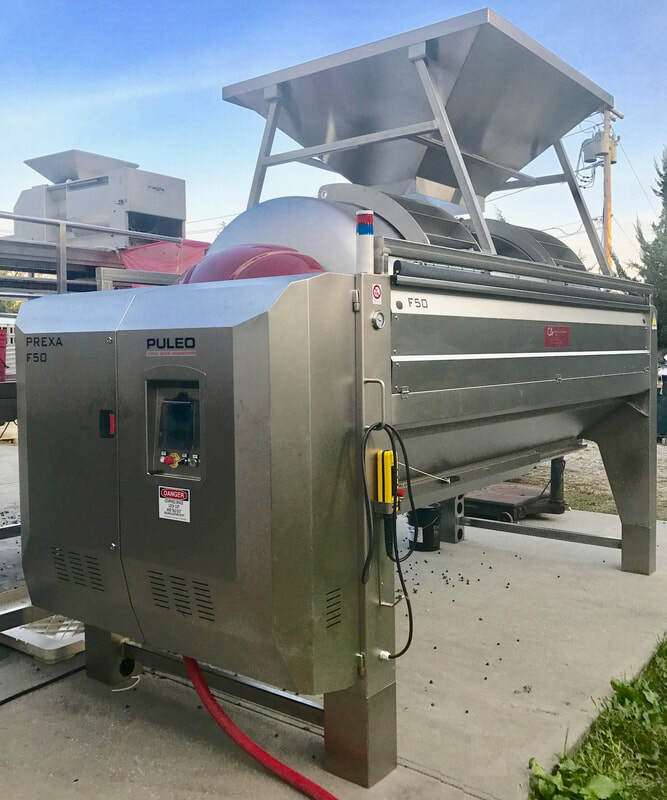 As the only supplier of crush equipment to the North American wine industry that is both importer and manufacturer, Carlsen have done it again by offering this little American beauty that has the same 12, 12- step program slots that our bladder presses do. You can run manual or automatic programs at will. The best thing about a basket press is turning loads of fruit around faster than you can with a bladder press. Our basket press customers have said so again and again. Click for a brochure or contact us for a quote. be sure to include your location.